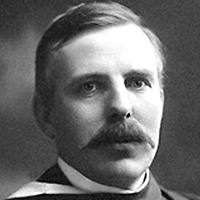 The creator of modern atomic physics and forerunner of the nuclear age, Ernest Rutherford was one of the greatest scientists of the 20th century. He was awarded the Nobel Prize in Chemistry in 1908 and a baronetcy in 1931, choosing the title Baron Rutherford of Nelson. In the words of Einstein, he was "a second Newton", the man who "tunneled into the very material of God": inventor, experimenter and Nelson farm boy. Rutherford’s strengths as a scientist are legion. A prolific, practical inventor and scientific theorist, his ideas were based on rigorous experimentation. He was one of the original "demo or die" scientists, turning conjecture into fact. He attributed his willingness to experiment and find unorthodox solutions to his hardscrabble background in rural New Zealand: "We don’t have the money, so we have to think".